Small point of interest here… Skip Townes, the sleazy rock concert promoter that Brenda Harpy is interviewing, is the same sleazy rock concert promoter from Funky who first appeared, if memory serves, in order to promote the Scapegoat Band’s world tour (his first appearance is in one of the first six Complete Funky Volumes, but it’s a Sunday, it’s hot, and I’m feeling too lazy to look it up today). 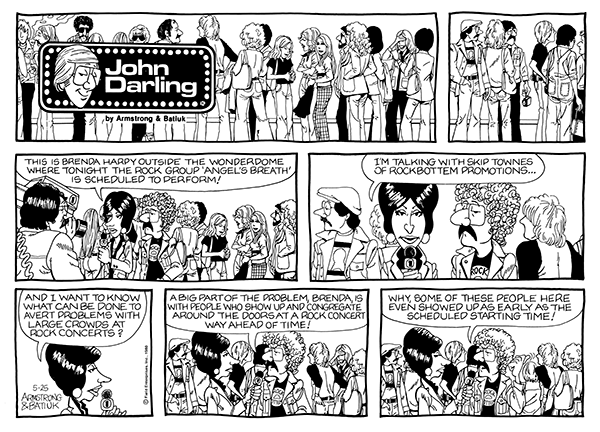 This JD strip also gave me a chance to vent about the way fans are treated at rock concerts. Nothing’s changed.